This Show was broadcast by No Lies Radio on August 2, 2011. We’ll also be discussing the state of the truth movement in general, and the upcoming Toronto Hearings in particular. 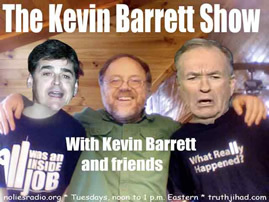 This entry was posted on Monday, August 1st, 2011 at 9:19 pm	and is filed under 9/11, Kevin Barrett, News, Protest, War Crimes. You can follow any responses to this entry through the RSS 2.0 feed.